countries in Iraq who have great financial and human potentials along with the promising market. 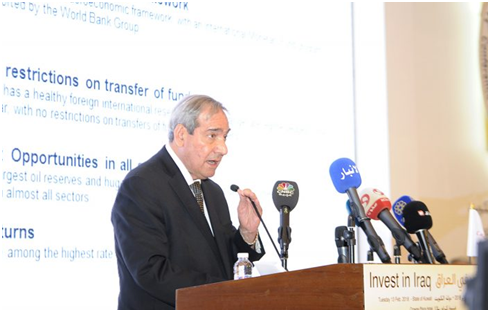 He stressed in an extensive press interview that the pledges, guarantees and financial facilities from major countries are very important for the investment business and for the investor who is always looking for financial guarantees in his projects, in addition to the loans that will be used to meet the needs of major projects (water, sewage, housing), where the state shall facilitate procedures to move forward with these services based on soft terms. As for the priorities in the opportunities and investment projects, the Chairman of the Commission explained that the housing sector has a great importance in line with the growing population of Iraq, which is followed by an urgent need for housing units. 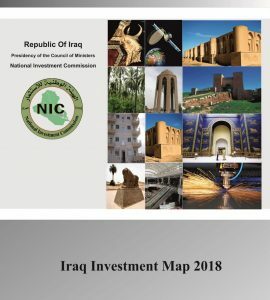 A project has been put up to build 25 thousand housing units in each province of Iraq, or more, with the experiences of successful international investment in this sector, including the Egyptian experience, where the Egyptian side showed the willingness of its companies to enter Iraq in cooperation with Iraqi supporting companies. In addition to the health services sector, which includes (16) opportunities for the completion of public hospitals and specialized ones. European and Gulf countries were interested in (50) opportunities in engineering industries to discuss the opportunities presented at an exhibition for the Iraqi industry organized after the conference, during which 26 public and private sector companies offered important investment opportunities, as well as important issues in manufacturing fertilizers and petrochemicals for internal needs and export to maximize the country’s financial resources. 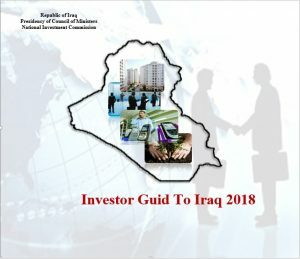 Referring to the ten-year plan approved by the Government of Iraq for the reconstruction of the Iraqi economy, We hope to be able to turn the losing companies into profitable companies to be a source of money instead of being a consumer and contribute to diversify the economy and not rely entirely on oil in preparation for the post-oil era that will put our economy in a major predicament in the absence of full preparation for that stage. Some argued that the data of Iraq reconstruction conference has come to the interests of the liberated provinces only, The Chairman of the Commission confirmed that this information is not true because the housing project includes the completion of 25 thousand housing units or more to include all the provinces of Iraq and the accompanying move to the economy through operating other projects as well as the agriculture projects in central and southern Iraq. Dr. Al-Araji explained the importance of this sector to play its role in the development of the Iraqi economy after a long period of state control over economic activity, we hope that this sector will play an outstanding role. More than (300) businessmen from inside and outside Iraq attended the conference. Iraq is proud of them in its internal and external economic forums. Partnership possibilities between the Iraqi private sector and foreign companies were discussed to implement the available investment opportunities. The Chairman of the Commission expected that the implementation of these projects will coincide with the growth of large and promising opportunities for jobs for different segments of society among graduates, craftsmen, technicians and others. He concluded with a reference to the formation of the (Baghdad Forum) soon as a continuation of the work of the Kuwait International Conference for the Reconstruction of Iraq.